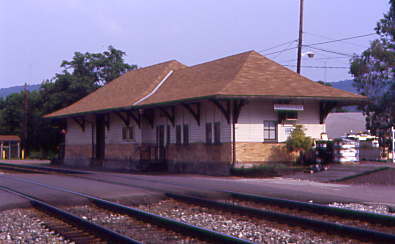 Chris Parker and I found the Western Maryland station in Cumberland, Maryland thanks to the excellent directions on their website. 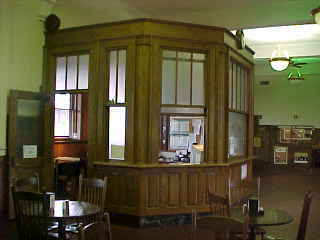 While Chris parked the car, I went inside the station to pick up our tickets. 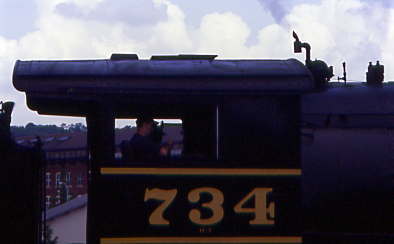 I went back to the car to pick up the cameras to start the pre-trip photography. 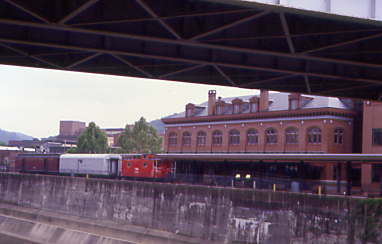 We photographed the Western Maryland station from both street side and trackside, which included the Cumberland River behind the station. 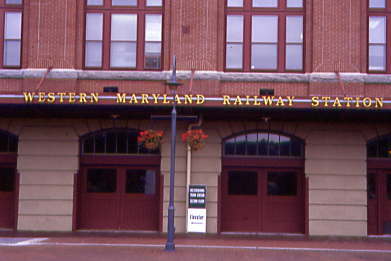 Former railroad's name on the building. 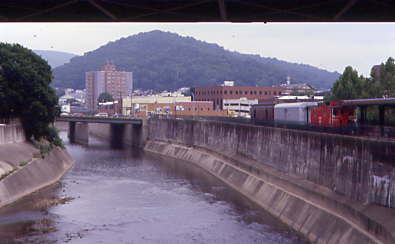 Station with the Cumberland River in front of it. 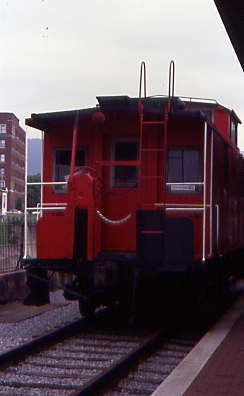 After that, we photographed Clinchfield Railroad caboose 1072 which was on display. 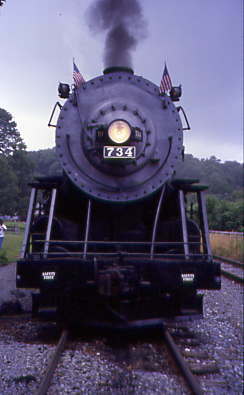 There is a marker that reads "The Western Maryland Railway Honor Roll World War 1 1917-1918. 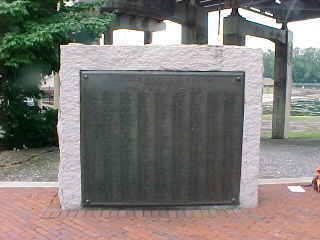 Out of the over 680 men on the list, only 20 "Paid the Supreme Sacrifice" being killed for their country." 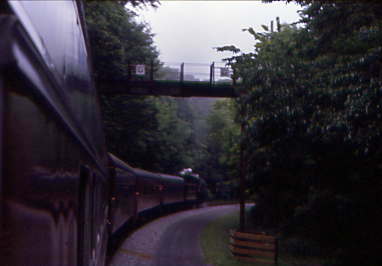 At 10:40 AM, the Capitol Limited that I rode to Pittsburgh rolled east out of Cumberland. 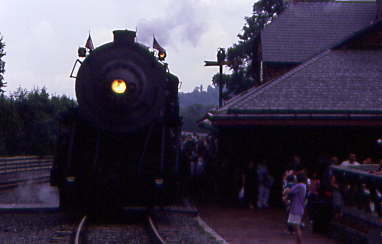 We waited at the east end of the platform for our train to arrive at the station from its storage location. 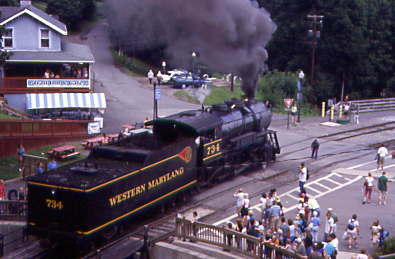 First Western Maryland GP-30 502 and the Western Maryland steam engine 734 pulled the train across the bridge over the Cumberland River. 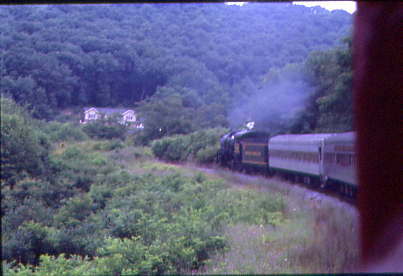 The Western Maryland 502 cut off on the fly then passed our photo location. 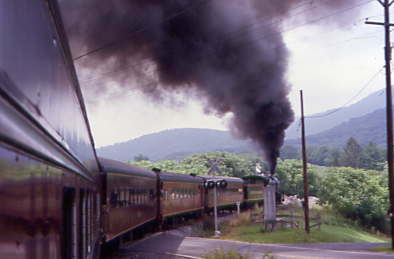 The Western Maryland 734 then came across the bridge but then came to a stop. 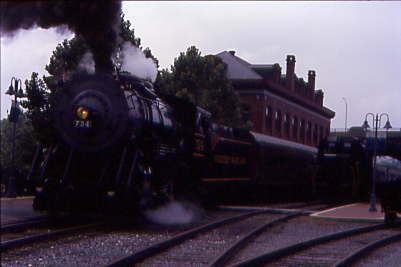 The Western Maryland 734 then started up and put on a great show coming into the station. 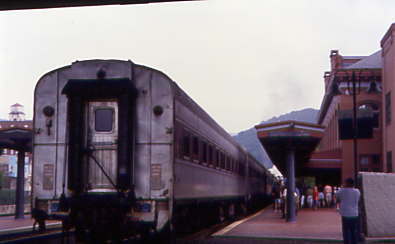 The rear of our train at the Cumberland Station. A walk forward was now in order. 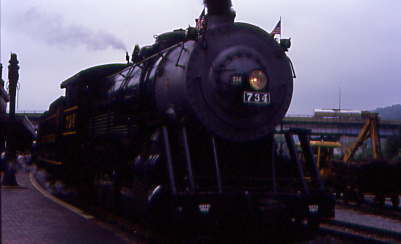 Our train at the station. 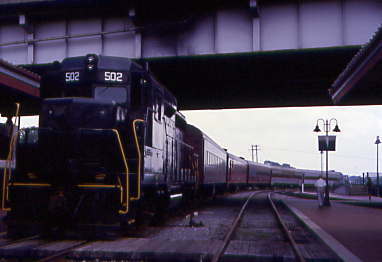 Across the tracks with both the Western Maryland 734 and 502. 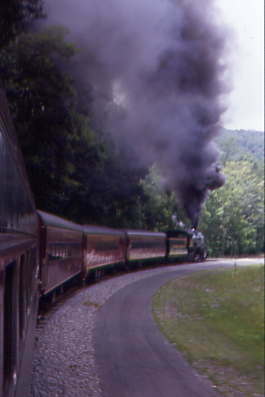 Western Maryland Scenic Railroad 2-8-0 734. 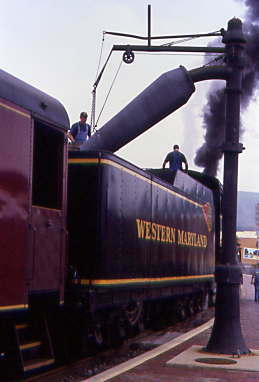 Western Maryland 734 taking water. 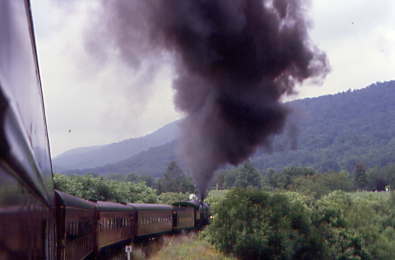 Our train had Western Maryland Scenic Railroad 2-8-0 734, Coaches WMSR 876 Cumberland, WMSR 726 Man O' War, WMSR 880 Frostberg, WMSR 200 Lounge and unnamed 110. 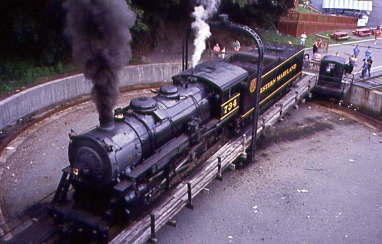 Chris and I then boarded taking a vestibule for my first ride on this fantastic railroad. 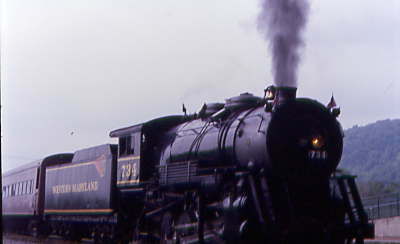 The oldest portion was the Baltimore, Carroll and Frederick Railroad which was chartered in 1852 and began building west from Baltimore. 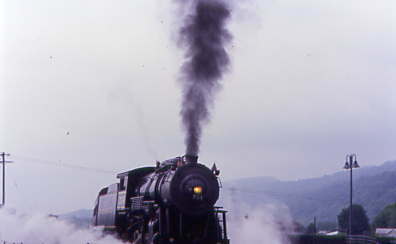 The railroad was completed to Hagerstown, Maryland in 1872. 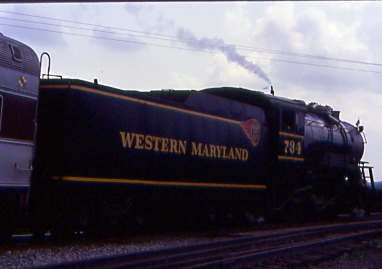 Within a year, its name was changed to Western Maryland Rail Road Company and eventually, it became Western Maryland Railway Company. 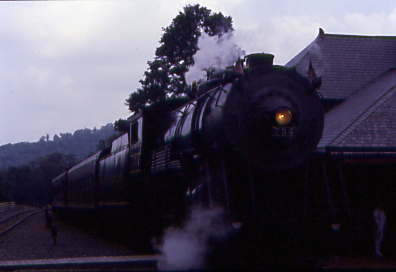 The Connellsville Extension was built west from Cumberland, Maryland, to Connellsville, Pennsylvania, beginning around 1906 and was completed in 1912. 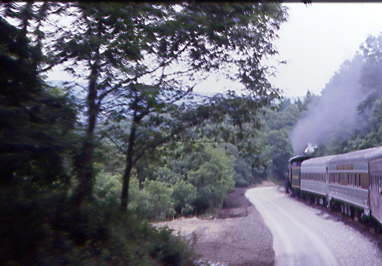 In 1931, the Western Maryland became part of the Alphabet Route, a competitor to more major railroads, including the Pennsylvania Railroad. 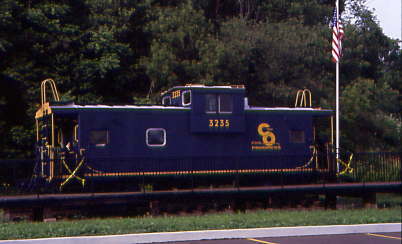 Thus, although never a giant, the Connellsville subdivision of WM handled through midwest fast freight traffic and coal from company-owned mines near Fairmont, West Virginia, and Somerset, Pennsylvania. 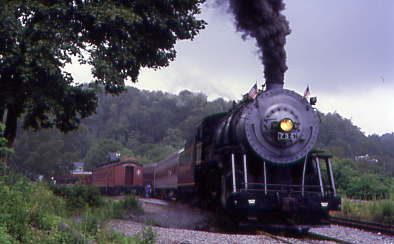 In 1930, the Pittsburgh and West Virginia Railroad Company reached Connellsville to hook up with the WM. 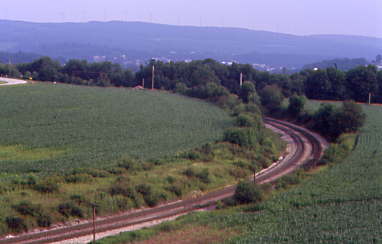 That line operates today as the Wheeling and Lake Erie Railway. 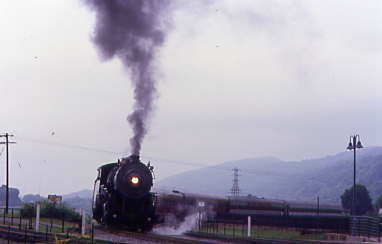 In 1964, the Chesapeake and Ohio Railway (C&O) and the Baltimore and Ohio Railroad (B&O) jointly filed for permission to acquire control of the Western Maryland Railway with the Interstate Commerce Commission (ICC). 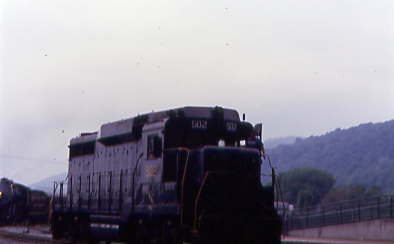 In 1973, as part of the Chessie System, the Western Maryland ownership went to C&O and it was operated by the B&O. 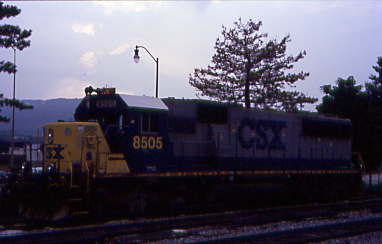 In 1987, it was merged into the C&O, which itself became part of CSX Transportation. 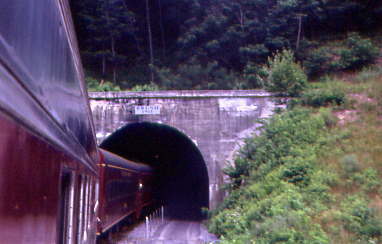 Much of the original Western Maryland line has been abandoned including the crossing of the Allegheny Mountains and the Eastern Continental Divide near Deal, Pennsylvania after going through Savage Mountain in a 3,000 ft tunnel. 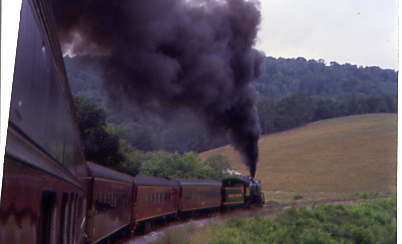 The Western Maryland Scenic Railroad now operates the portion from Cumberland to Frostberg. 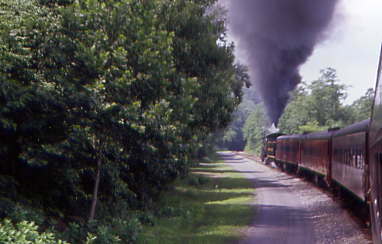 Other portions of this historic railroad are now rail trails. 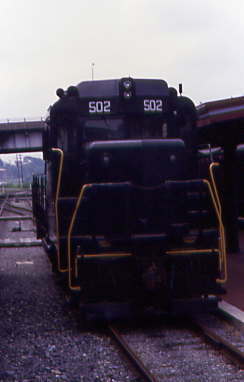 We departed at 11:30 AM and soon passed the Western Maryland GP-30 502. 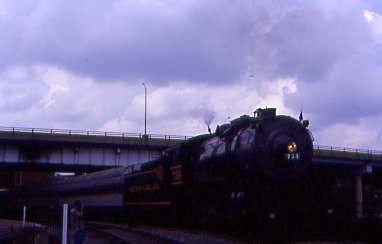 The train crossed the Cumberland River. 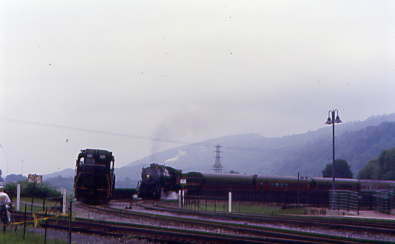 Passing some of the freight cars they use when they run steam photo freights. 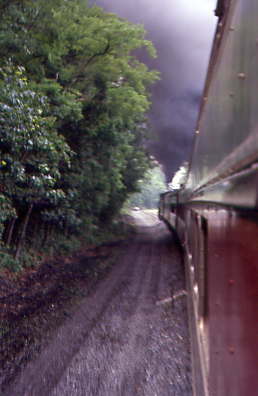 Next, our train entered the Narrows. Here I got my first cinder in my eyes. 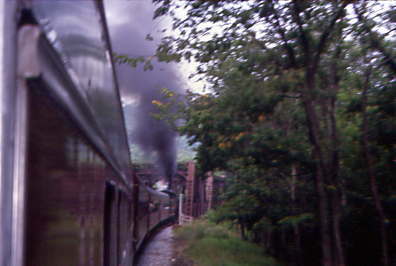 I had forgotten that this engine was a coal burner and left my eye goggles at home so taking pictures on this trip meant I would have to be careful. 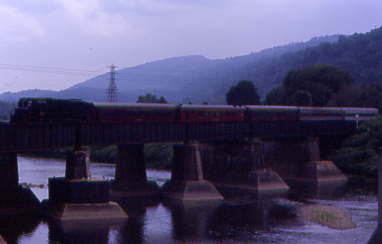 Our train approaching the Bridge in the Narrows. 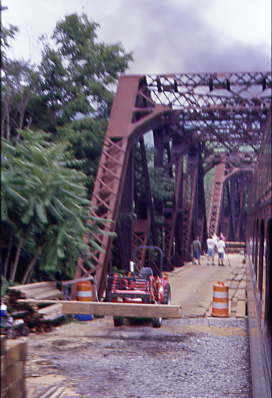 Our train approached the Bridge in the Narrows where once there was a second track. 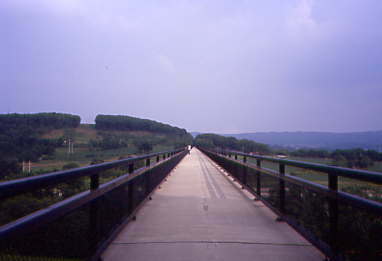 In the future, it will be a cycling and hiking trail that once finished, will follow the entire length of this railroad. Our route took us through the forests as we ran along the slope of the hill. 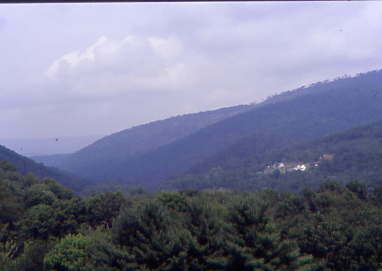 The view looking out between the trees. 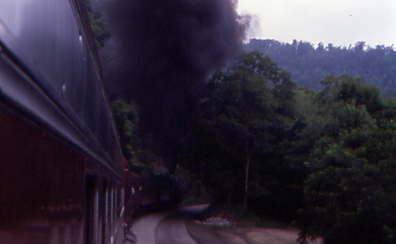 Next our train rounded the famous Helmstetter's Curve with the barn below. 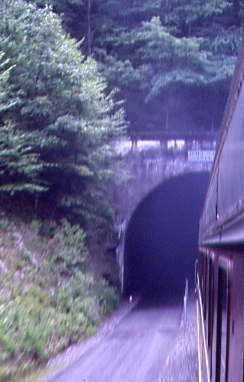 We approached and passed through Brush Tunnel. 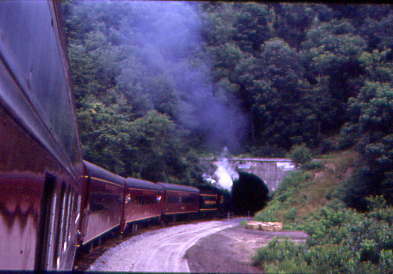 The train passed through the Brush Tunnel. 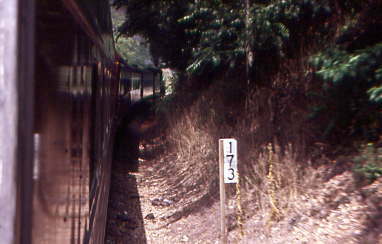 Our train passing MP 173. 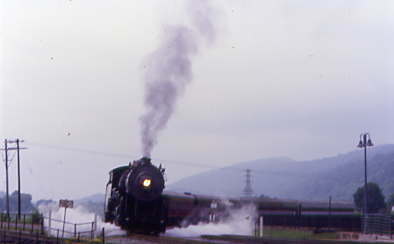 The train continued the climb towards Frostberg. 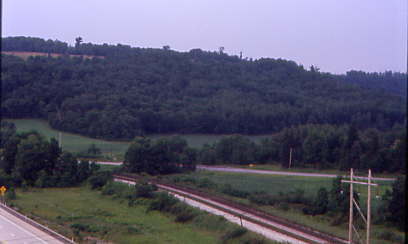 We ran near the Woodcock Hollow. 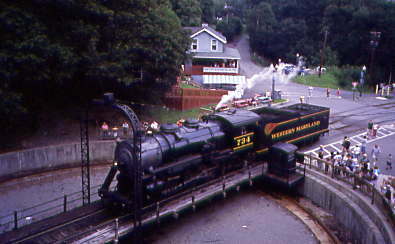 After our train passed beneath a former Western Maryland Railroad signal bridge, we arrived at Frostberg, where I detrained and took a picture of the train in front of the Frostberg station. 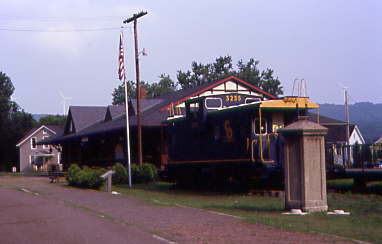 The train in front of the Frostberg Station. 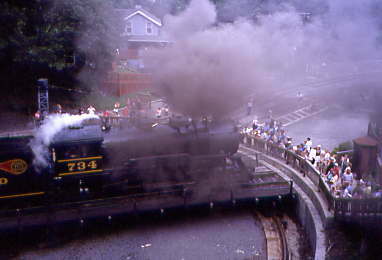 After this picture, I headed up the stairs that overlooked the turntable. 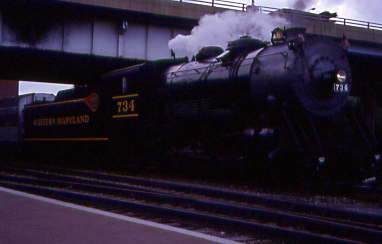 The Western Maryland 734 had cut off the train and approached the turntable. Turning on the Turntable at Frostberg. Pulling off the turntable with Chris Parker in these views. 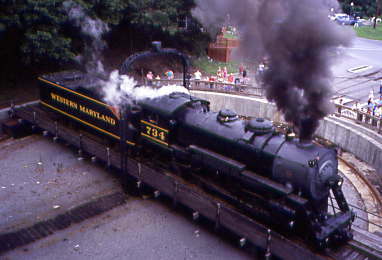 Views of the train after the Western Maryland 734 had been turned. 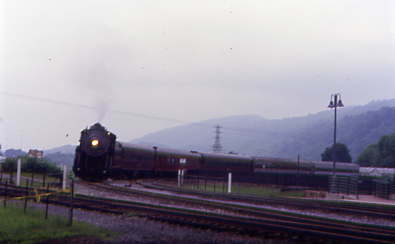 The train drifts downgrade on the return trip. 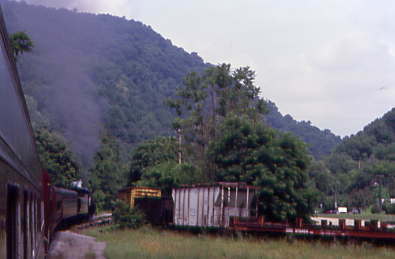 After rounding Helmstetter's Curve, Chris and I moved into the much cooler Cumberland car for the remainder of the trip. 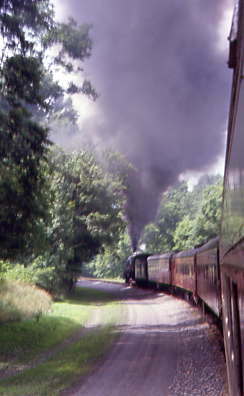 It had been a fantastic ride aboard the Western Maryland Scenic Railroad and it is a trip I think everyone should take! 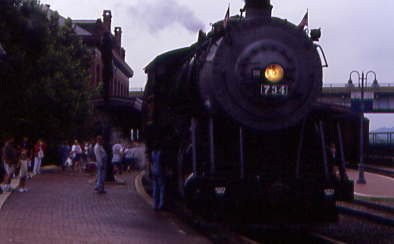 Back at Cumberland we detrained for a few more pictures. 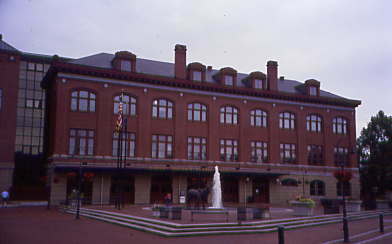 Back in front of the Cumberland Station. 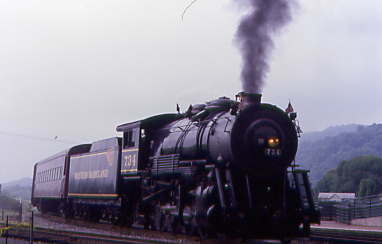 Another view of the Western Maryland 734. 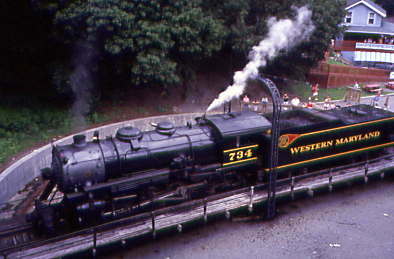 Our engineer was now getting ready to take the Western Maryland 734 back across the river to the shop. 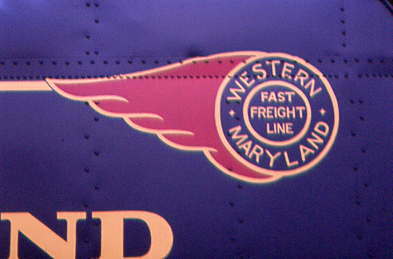 The great looking Western Maryland emblem. 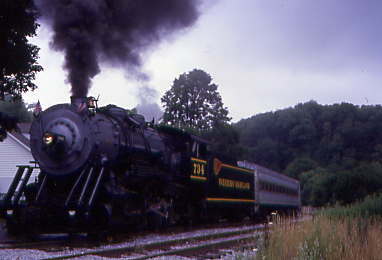 Western Maryland 734 headed back to its shop. 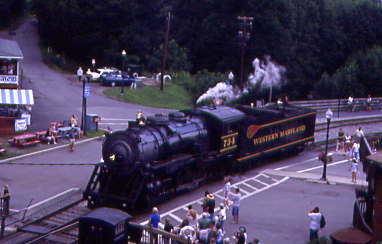 Next Western Maryland GP30 502 was getting ready push the passenger cars back to the shop. 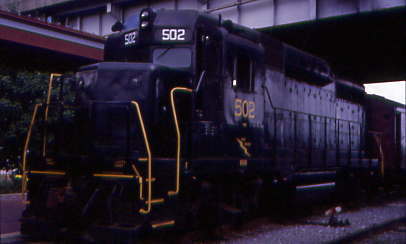 Western Maryland 502 almost ready to go. 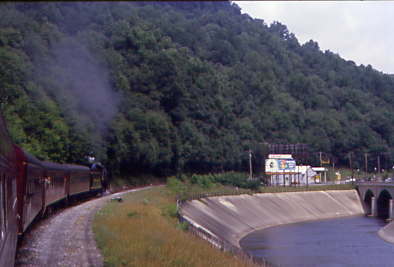 Western Maryland 502 took the cars home across the Cumberland River. 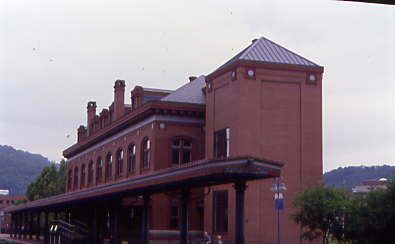 One last look at the Cumberland Station. 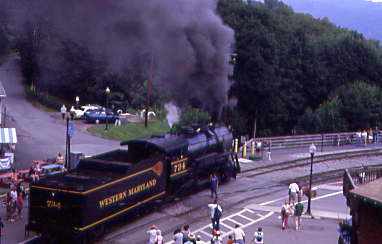 I went inside and bought a T-shirt and post cards before Chris and I said our goodbyes to the Western Maryland Scenic Railroad. 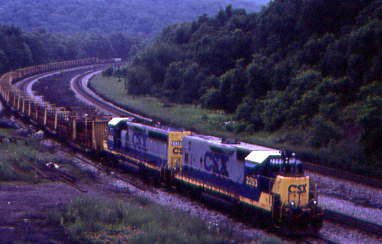 After the trip our next location to visit would be CSX Sand Patch Summit. We left Cumberland fine but soon took a wrong turn that took us to Fairhope. 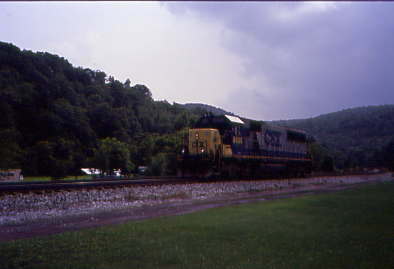 Here we caught an eastbound CSX helper set drifting downgrade to Cumberland. 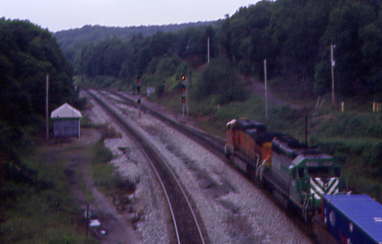 We headed west towards the Sand Patch but made another wrong turn and missed another eastbound CSX freight. After a few miles of dirt roads, we found the main highway and a couple of left turns got us to the bridge at Sand Patch Summit. 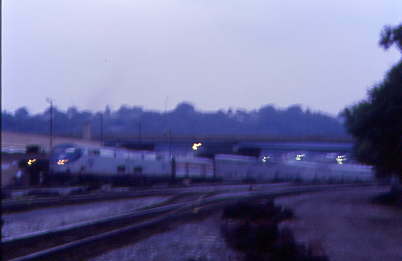 A CSX rail train was sitting in the siding shut down for the late afternoon. 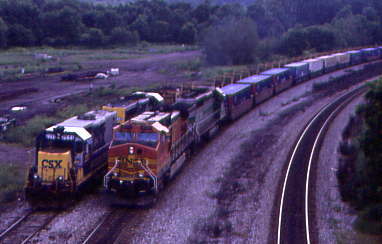 We heard a horn which signaled an eastbound train which turned out to be a stack train led by a BNSF and FURX units. 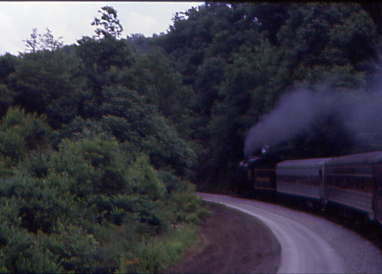 Train heading towards the Sand Patch Tunnel. 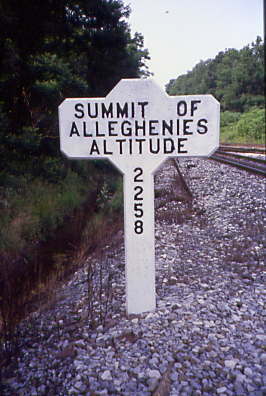 I took a walk to the Summit of the Alleghenies sign. 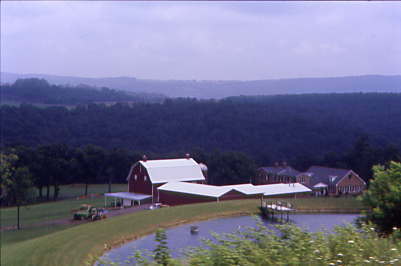 We decided to head west to look around, so drove to Meyersdale. 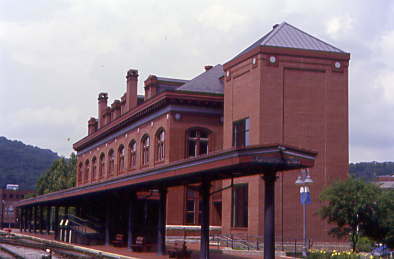 Here we found the B&O Station. 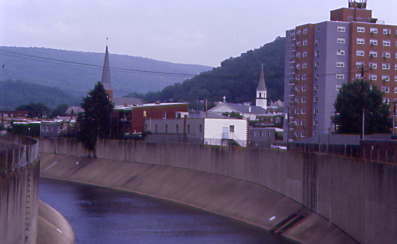 From here we drove to the former Western Maryland Salisbury Viaduct. 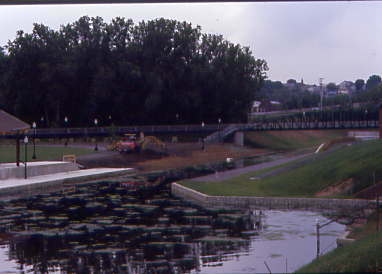 We walked the full length of the bridge which is now a bicycle trail. 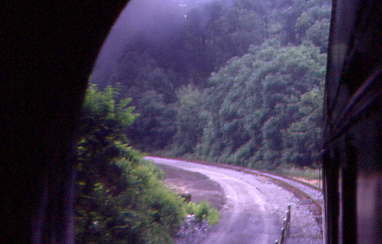 Views of the CSX Mainline. At the west end I found this sign board. At the west end the view across with Chris Parker in this view. 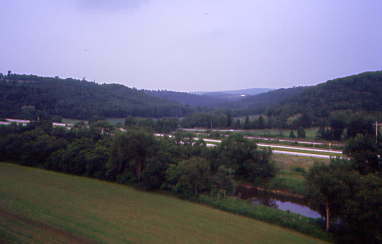 The view of the river below. 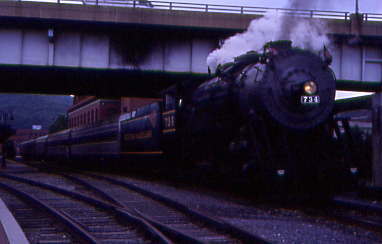 A CSX helper set dropped west under the Salisbury Viaduct. 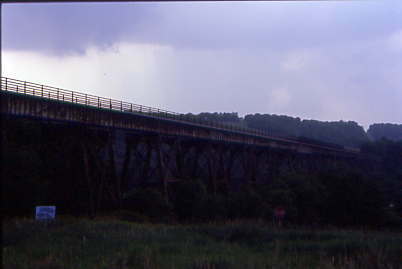 We walked back over the viaduct and to the car. 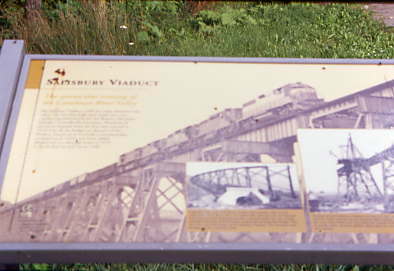 Ground views of the Salisbury Viaduct. 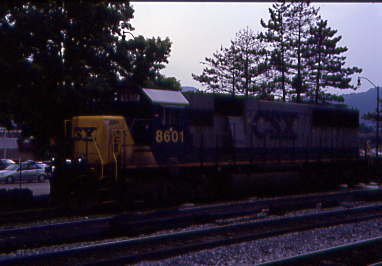 Chris and I spotted a pair of CSX Helpers. 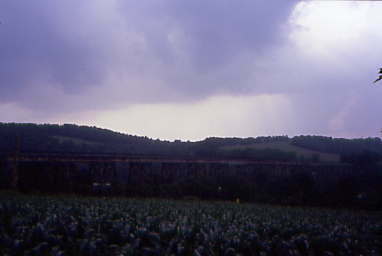 We walked back to the car and returned to Cumberland in search of food through a driving rain storm. First we tried TGI Fridays in Cumberland with no luck. Someone there needs to start a tri-tip sandwich stand and would be very successful. 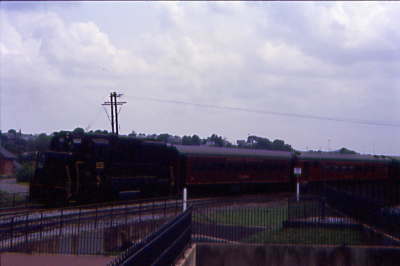 We returned to the car, got our cameras and a photographed the westbound Capitol Limited running an hour late. On the way out of town, I stopped at KFC and Chris stopped at Wendy's. 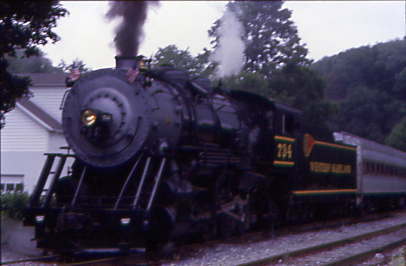 We took West Virginia Highway 28 down to Romney after dark, passing our train for tomorrow. 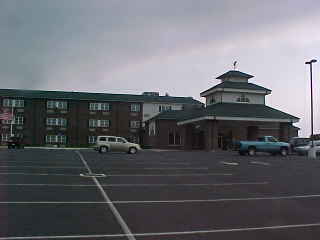 Once in town, we took US 50 east up the hill to the South Branch Inn where we would spend the night. 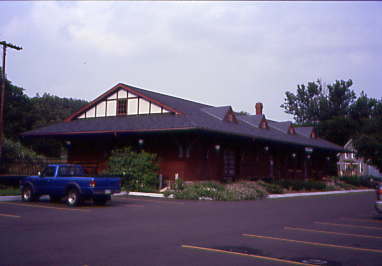 The South Branch Inn. 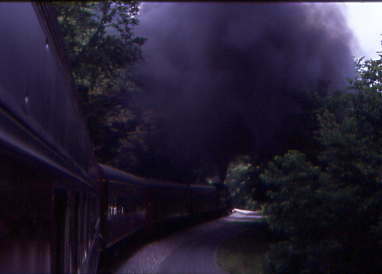 Tomorrow we will ride the Potomac Eagle Scenic Railroad, but first a good night of rest.